Gilad guides you through these workouts expertly as only he can. You are always aware of the exact muscle you are working and of the proper form in order to get every last ounce of benefit from your workout. plyometrics and coIn each workout Gilad incorporates the best of strength training, circuit training, cardio bursts,re training into this one-of-a-kind, new generation workout routine for the whole body. You will develop key athletic abilities such as explosive strength, isometric endurance, balance and flexibility for stronger, leaner, sexier you! The killer cardio segment will help you speed up the fat burn! Light hand weights and resistance bands are used (optional) for extra resistance. The workouts are taped in Hawaii on Magic Island with Waikiki Beach and Diamond Head as a backdrop. 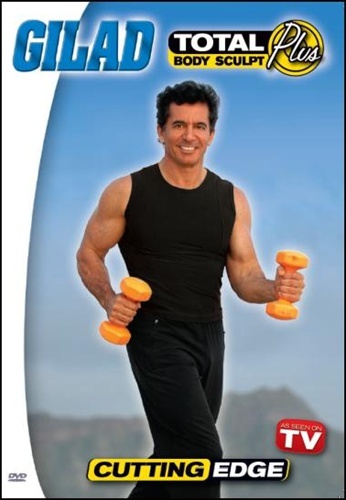 I have loved Gilad's' workouts for MANY years. The only negative is the breakaways during the DVDs...I know these DVDs are taken from TV shows and that's why they happen, but it cuts some segments short. Otherwise perfect. I enjoy the entire Total Body sculpt series, only wish they were 60 minutes. This dvd is great for toning your muscles. I really enjoy the DVD but have a knee injury at present which has slowed my excercise at the moment; not a result of DVD though. The shipping time was excellent; keep up the excellent job and your customer service has been outstanding. I am looking forward to doing more business with you.